Today on board the Asteria for the 10am whale watch, we traveled to the Southwest corner of Stellwagen Bank in pursuit of whales. Once we arrived at the bank we found a group of 4 humpbacks! It was Perseid, and her calf, and Milkweed and her calf. 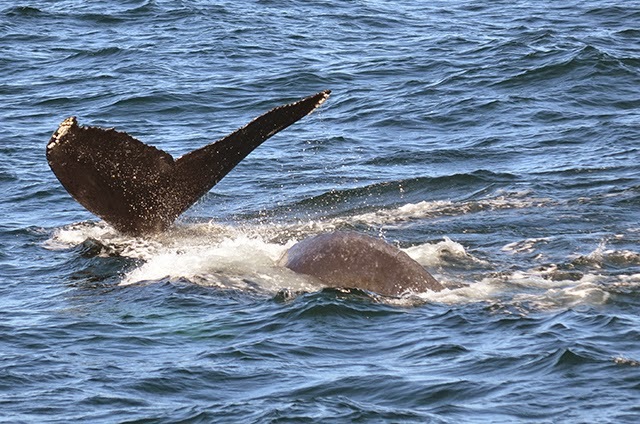 These two mom and calf pairs traveled close to one another and took some 5-7 minute dives. While the moms were down on a dive the calves kept us entertained at the surface. They rolled around, practiced some fluke-up dives, and Perseid’s calf even treated us to a FULL breach!! After 15 minutes or so, the two Mom/calf pairs split and traveled in opposite directions. We stayed with Milkweed and calf as they swam towards an area where we observed 20+ Northern Gannets and Greater Shearwaters dive-bombing into the water to catch prey. As Milkweed dove down to feed, her calf approached the boat to check us out. See attached photo of this curious calf next to the boat. At this point in the season the calves are becoming more independent from Mom. We also noticed that the calf has grown quite a bit since we first saw it in the beginning of the season. It’s great to see another healthy humpback join the population here. Towards the end of the trip, the calf swam right under and across our bow and treated everyone to a close up tail slap. It was GREAT!! See attached photo of that moment. Also check out of the photo of the Calf’s fluke. It already has changed drastically since the beginning of the season. Overall, it was a fantastic day out on Stellwagen. This afternoon we headed out to the southwest corner of Stellwagen Bank. It was super choppy out today, but luckily we had great visibility and were able to make it out to the bank to find whales. Tiny whitecaps made it tricky to find whales until one breached in the distance! 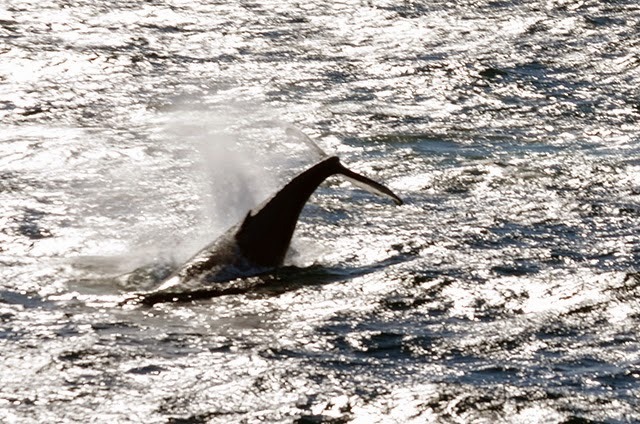 Captain Chip zipped over to the breaching whale to get a closer look. Once we got there, things started to settle down. The breaching whale turned out to be a calf! Soon, the mother came up to the surface and we learned that it was Perseid. Throughout the rest of the trip, the calf continued to be active at the surface while Perseid took 4-5 minute dives, possibly doing some subsurface feeding. The calf treated passengers to a bunch of tail breaches! As time wound down, and we started heading back to Boston, the calf continued to be active at the surface giving passengers great looks as we began our journey back to the city. We had a great day out there! !